The Sports Fix - Mon Apr 13, 2015 | Gus and Gus Eat The World and its MONEY! From: Gus and Gus Eat The World and its MONEY! Kicking off a new week on Clevelands hottest sports radio, click the link, TUNE IN and JOIN US! 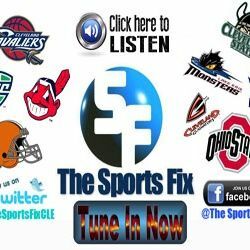 We talk about a dark sports weekend, and how silly it is when compared to the story of Lauren Hill and her courageous few months in Americas spotlight, Indians fans, lets re-think whole SI Cover Jinx theory, after nearly losing Gomes for the year, Tigers sweep Tribe and Miggy GOES OFF, Dan Wismar is here talking Indians first week, Tigers, Cavs in chill mode until Thursday, Jordan Spieth owns Masters ... See More but Tiger rises from the dead, Monsters playoff push continues and so much more... GET YOUR FIX!